Kiyash and I are thrilled to announce our new project: limited edition adventure jewelry. The Latchkey Project was inspired in part by all those lovely old text adventure games, in which picking up a random key early on always paid off. 1. 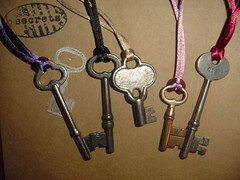 Wear your vintage key around your neck. 2. Search for the lock your key opens. ~ Ask people you meet while wearing your key if they have any clues for you. ~ Let your friends touch it for good luck. ~ Sleep with it under your pillow to dream about its previous owner. ~ Make a list of exciting places where your lock might be waiting for you. Go there! The vintage key necklace and search kit is $28 USD, with free priority shipping in the United States. You may wish to read our Latchkey Project FAQ. We have sold out of our first series of keys; however, a limited edition second series is now available for pre-purchase at the project website. Second series keys will ship on January 16, 2006. 20 exquisite rules. Play along at home!